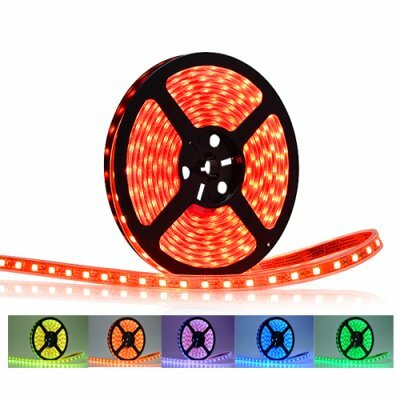 Successfully Added Premium Flexible Multi-Color LED Light Strip (5 Meters) to your Shopping Cart. If you're looking for ultra high quality LED rope light then you've found it. Or order several units and you've got yourself an DIY LED light board at a fraction of the cost. Perfect if you own a pub, restaurant, or cafe. In fact, this ultra versatility LED light strip is the ideal product whenever or wherever you want to attract customer attention. It's the perfect attention getting signage tool for your animal hospital, your clothing emporium, or your vintage vinyl record store! Note that when using this outdoors, while the rope light itself is waterproof, the power supply IS NOT. The power adapter, connector, and remote controller MUST BE KEPT DRY AT ALL TIMES! This item is the best solution for ambiental lighting projects. I hope that this product does not disappear from the offer and continue to be produced and displayed on the site.